Concerns raised by medics over north-east toddlers’ development are well below the Scottish average, new figures reveal. Nicola Sturgeon has denied Labour claims of a staffing crisis in the NHS, saying record numbers of people are employed in the Scottish health service. 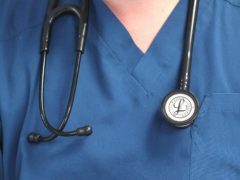 A record number of people are working for the NHS in Scotland but the number of vacancies for doctors, nurses and midwives have prompted claims of a “workforce crisis”. A new screening service for those concerned about bowel cancer has been launched at a north-east hospital. Women in the north-east are being advised not to ignore their cervical screening test invite. Scotland’s first post-graduate course for doctors is an “accessible option” for those considering a career in medicine, the Health Secretary has said. The NHS has confirmed it will move into a new Aberdeen city centre office development before the end of the year. A study led by Aberdeen University has found Scotland is leading the way in the care of hip-fracture patients. ​The NHS and Royal Bank of Scotland are both eyeing a move into Marischal Square, the Evening Express can reveal today. Aberdeen Royal Infirmary has remained below the national average on A&E waiting times for the fifth week in a row. Inspectors found two patient trolleys “heavily contaminated with blood and faeces” on a visit to Scotland’s newest hospital.